I’m no Harlan Ellison, but I do enjoy a good rant. And I enjoy writing them. No, I take that back. I don’t enjoy writing them. I hate writing them. Because it means that I have a need to write them. But it has to be done. I am going to share with you a portion of a letter I wrote some time ago. It’s a good start. I’ll sum up (again) the Burton movie with this; It’s not good. It’s not good Dark Shadows. It’s not a good comedy. It’s not a good demonstration of Burton’s strengths. It fails on every level. Even Collinwood loses its warmth. Now, from a letter penned by yrs. tly. It was in response to the question of whether or not I ever regretted the project. I also knew that I was doing something that had never (to my knowledge) been done. Which is a cool thing to wake up to. And that I had made it VERY public was a profound motivator. I really couldn’t afford to get mopey. Beyond that, I just loved the show. 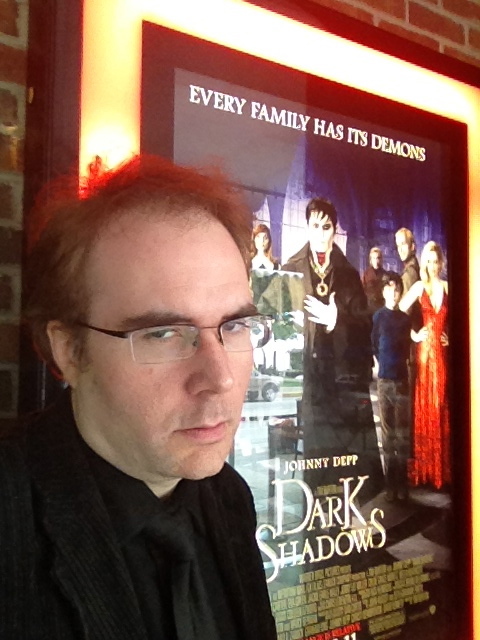 Having survived the Great Whedonizing of the 2000s, I was incredibly used to hipsters putting down DARK SHADOWS. One thing that really perked me up was finding that great vein of hip, funny, insightful DARK SHADOWS fandom lurking out there. At last — no longer alone! I’m sure Mr. Burton knows nothing of this, or would think me mad if he did, but I can go to bed at night knowing that I gave this incredibly formative and wonderful story all of my time and my love. As a thank-you. The thank-you I would have given had I been in that director’s chair. That was not my opportunity. This was. Here’s the worst part. He’s an artist. MoMA-certified. He should understand this. As a stop-motion animator, how does he feel about the CGI CLASH OF THE TITANS? I hope he has enough soul to shake his head and wish that they had used all of that technology to make the bestest stop-motion film possible. THAT’S the point of CLASH OF THE TITANS. It’s the point of KING KONG. It’s the magic of the stop-motion medium. You want the magic of DARK SHADOWS? Go to Big Finish. They get it. So, very deep feelings about a lot of things intertwined with my love of the show, and that kept me motivated. And think about the schedules the actors on the TV show had. Yes, they were well-paid and got famous, but that kind of work is very grueling. Coming from the theatre, where all art is inconvenient, I understand the duality of feeling that can grow for an audience who (through understandable ignorance) treats an afternoon at a show like a trifling diversion. And, of course, how could they possible “pay” in time and emotions in a way equal to the people putting on the show? When I had a van Gogh magnet on my refrigerator, I finally had to take it down because it felt disrespectfully minimizing of the suffering and pain he went through to bring us such beauty and insight and unique vision. He didn’t do it so I could hold up a Domino’s coupon. In short, those actors, writers, directors, producers, designers, and technicians all busted their keisters to give us those dreams. That art was not convenient for them to make. At times, it felt like a sign of respect that it was not convenient for me to consume. It was a tough job for them. With the long hours and early wake-ups, I felt a bit of solidarity. In retrospect, I could see how an actor might not get that as a compliment. But this is assuming that I’m all ready in line to get a book signed or something, so my adoration should be evident. Moments after crawling from the opening day wreckage. I keep thinking that fan fiction writers show respect, in that they acknowledge that the work of the cast and crew made the characters so real that they want to know nore about them, and fill ihn the gaps. The results vary, according to their talent and understanding, but I do not think that a fan writers ever gives less than his or her best. There is no monetary reward (until there began the professional writing) It is a labor of love. We give happy endings to those we think deserve it, we give big scenes to characters thta we think got shortchanded (along with the actors portraying them), and we try to solve the continuity and logical disconnect problems taht the harried writers could not keep track of. And we try to build a canon from shreds and patches. We love the original, and we want to make it perfect. Good to see SOMEONE figured out what this was all about. With so much hostility toward this film, it was like a political debate inside a church. It’s fanfiction and frankly it was about BLOODY time that old duffer jumped after his love! I wondered when the Tim Burton treatment would be a commentary by realmccray. It was worth the wait. I did not see the TB DS film although I really like Johnny Depp and am glad that I did not. Anyway, well done and I love your picture at the end of the post. One picture is indeed worth a thousand words.